When feeding as part of the BARF diet we advise you to give your dog a natural snack or bone immediately after its meal. This extends the time the dog is busy with food in a natural way. When chewing a natural snack after its meal, it develops enzymes which digest his meal better. Berriewood BARF meats are quick frozen from fresh to maintain superior quality. Whole chicken necks. Ideal served as part of the BARF diet with raw meat and the Berriewood BARF Vegetable & Herb Mix. Raw chicken wings. 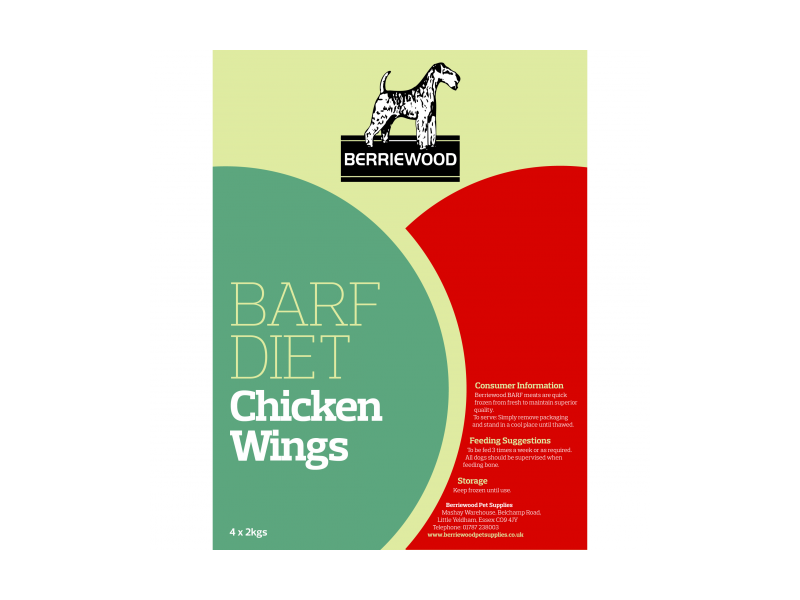 Ideal served as part of the BARF diet with raw meat and the Berriewood BARF Vegetable & Herb Mix. Whole chicken carcasses. Ideal served as part of the BARF diet with raw meat and the Berriewood BARF Vegetable & Herb Mix. To be fed 3 times a week or as required. To serve, simply remove from packaging and stand in a cool place until thawed. There are currently no questions for BARF Diet Poultry Components Breeder Packs - be the first to ask one!